In the following simple solution, I will show you how to restore a Dell Studio laptop to Factory settings or default condition by performing a Dell Factory Image Restore from the Dell Studio Recovery Partition. The Dell Studio Recovery Partition huses a custom Windows Vista Operating System Image, containing all of the essential drivers and tools designed to work with your specific Dell Studio Notebook. There are many situations in which you might want to restore your Dell Studio Operating System. Maybe your operating environment has become corrupted and you need to start over with the fresh install? Maybe you are selling the laptop and need to reinstall Windows Vista so that your information is gone and the new user is starting with a clean slate? The following method used to restore Windows Vista from the Dell Studio recovery partition works on Dell Studio 1535 or 1536 series laptops. It may work on others as well. 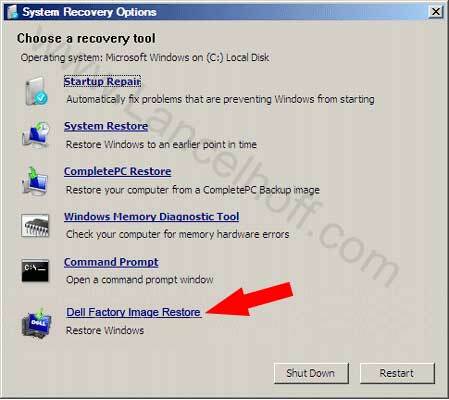 The Dell Factory Image Restore option enables you to restore your hard drive back to its original factory configuration. Returning it to the condition it was in when first received from Dell. WARNING: When you restore the computer to the default factory configuration, all data on the C drive is deleted. Before performing this procedure, you should back up your personal files. Windows VistaÂ is now installed on your Dell Studio, configured just as it was when you first received the Computer.